This precious room decorated in shades of peach and hunter green features elegant 14-foot high ceilings and impressively tall windows with original Victorian redwood molding. 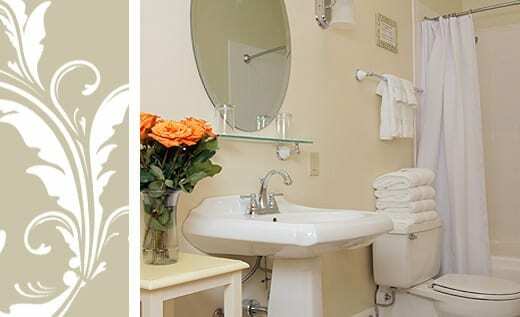 This is a quite room located at the end of the hall and includes a comfy queen bed with an antique armoire and an attractive bathroom with a pedestal sink and traditional tub and shower. Perfect for an adventure in the redwoods or a romantic getaway.